Company Name: Koushin Industry Inc.
Realization of housing demolition consisting of 100% recycling, where no waste is generated at all. Our company mainly carries out demolition of homes and buildings, sorting and recycling of construction waste generated from demolition (wood chips, glass chips, concrete chips, plaster chips, etc. ), recycling of other ceramic chips, etc. generated at factories, and processing of rubble. The biggest difference between us and other demolition companies is that we eliminate landfilling, which was linked to an increase in disposal costs, sort the recovered waste, and recycle it into products that can be sold at value. In principle, all of the waste that is generated at demolition sites is brought back to our plant, and reborn into new raw materials for products. We are making approaches toward encouraging awarenessraising, and originality and ingenuity among our employees, such as by selecting an “Eco Slogan Award” within our company. Waste that is generated when demolishing a home, such as wood chips, concrete chips, etc. are finely sorted by type, and are processed at our plant into products that can be sold at value. Although labor increases due to detailed sorting, we achieve 100% recycling. The costs for landfill disposal are cut down, making this a superior demolition method in terms of both economic performance and resources utilization. We provide demolition services as well as rubble recovery and recycling services for general households and companies that require demolition, as well as for factories that generate ceramic chips, glass chips, etc. 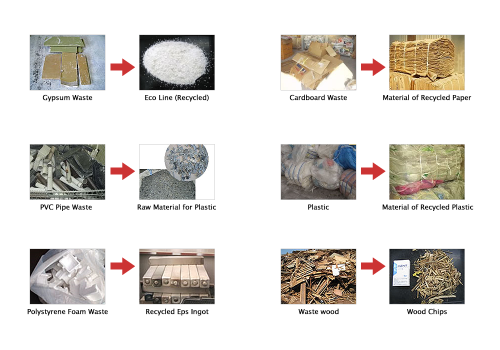 We have expectations for popularization of our technique in Asian regions where economic development is prioritized and not much consideration is given to recycling of construction waste. Gypsum, PVC Pipe, Polystyrene Foam, Cardboard, Plastic, Waste Woods and More.